I had a craving for something sweet this evening which is nothing new. It happens WAY too often. 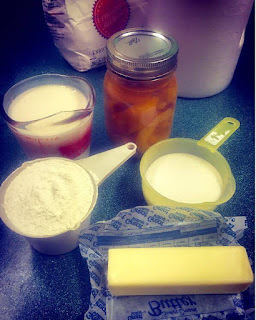 I was mentally going through what was in my pantry and I realized that I had everything I needed to throw a peach cobbler together: peaches that I had canned this past summer, flour, sugar, butter, and milk. Simple enough, right? Those simple ingredients are something that most people have on hand at any given time and they are something that the early Appalachian settlers would've had too. Many of their old recipes were transformed because the ingredients needed were hard to come by. They "cobbled" together what they had, usually using canned, dried, or fresh fruits. Now I'm not saying that cobbler is strictly an "Appalachian " dessert but I think it's safe to say that you'd have a hard time attending an Appalachian get-together (reunion, dinner on the grounds, homecoming, etc) that didn't have a cobbler or two. It has become an accepted part of our food DNA. My peaches from this past summer. Wow, one cup of sugar seems like a lot. Those peaches are already sweet so I'm going to half it. That'll make it a little healthier. 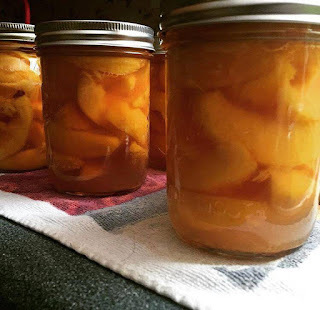 I think I'll also add another can of peaches but I'll drain the second one. More fruit is healthier, right? Right! Maybe I should cut out some of the butter...who am I kidding? The butter stays! This sure is going to make a big cobbler. But there will be leftovers for a day or two! 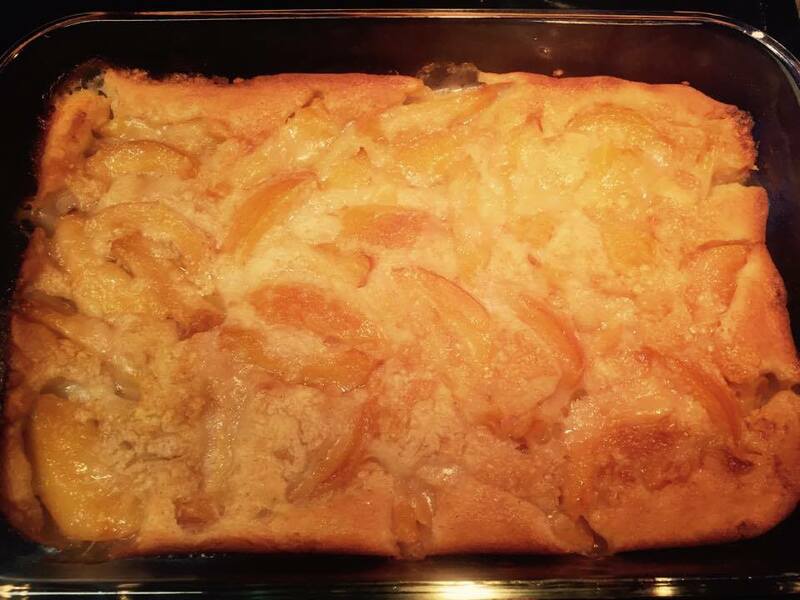 Right, you know good and well that you're going to end up eating peach cobbler for breakfast tomorrow morning. But it's okay because it has less sugar and more fruit! This is my struggle every time I make dessert, y'all. Every. Time. Enough of that. Let me tell you how I throw all of this together. First, preheat your oven to 350*. Unwrap your butter, put it in a 9x13" baking dish, and let that butter begin melting while you mix up everything else. Mix your milk and sugar together and then mix in your flour a little at a time to avoid it clumping up. I also add a little cinnamon but that's totally optional. Once your butter has melted, remove your dish from the oven and pour your batter into it. If you're using one can of peaches, just pour the whole thing over the top. If you decide to be healthy *ahem* and add more fruit, drain your second can. Do not stir. Bake for 45 min to 1 hour. Most southerners enjoy a big scoop of vanilla ice cream or whipped cream on top, but I'm trying to be healthy. ;) Strawberry rhubarb is my favorite kind of cobbler but I didn't have either on hand and went with the peaches. What's your favorite kind of cobbler?